Hotel Rialto offers a transfer and tour of a Murano glass factory for free, so I decided to give it a try while I was in Venice. 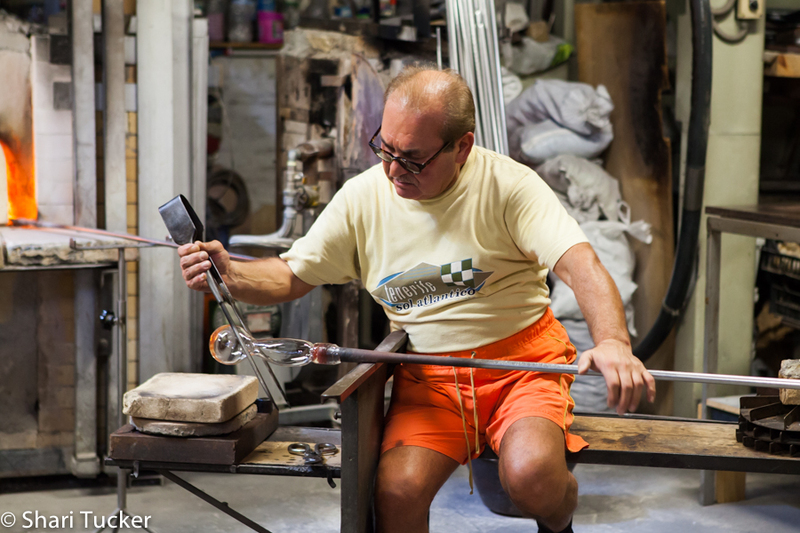 After-all, I had wanted to visit Murano anyway and I love seeing artisans at work. 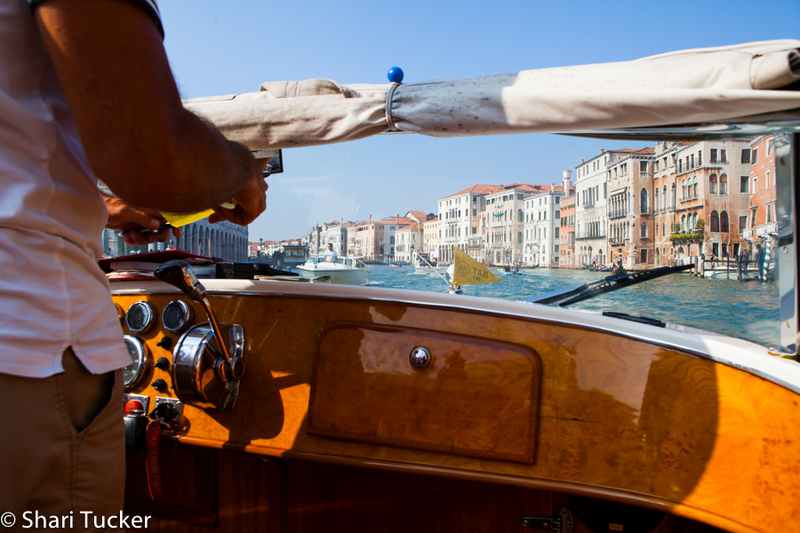 I gave the front desk about 15 minutes notice and they had a boat and driver pick me up right at the hotel for 3pm. It ended up being a private taxi-boat, one of the fancy ones and I was the only person on the boat. I guess it is less busy on Sunday and I was taking the last tour of the day. The private taxi had a covered inside section with windows and leather seats – room for about 10 people. I, however, stayed up front in the fresh air and sea breeze with my driver. He was friendly, but didn’t seem to want to talk, so I took pictures and video on the 15 minute transfer to Marco Polo glass Factory on the island of Murano. As soon as my boat arrived, I was greeted by Alex, who immediately made me feel welcome with his warm, friendly personality and his excellent English. He ushered me right in to the factory where I got my own private showing of a Master glass blower at work. The blower’s name is Mariano and he is well known for his art. I then got a tour of the factory’s art gallery which houses hundreds of unique, one of a kind master pieces by the artists who work in this particular factory. 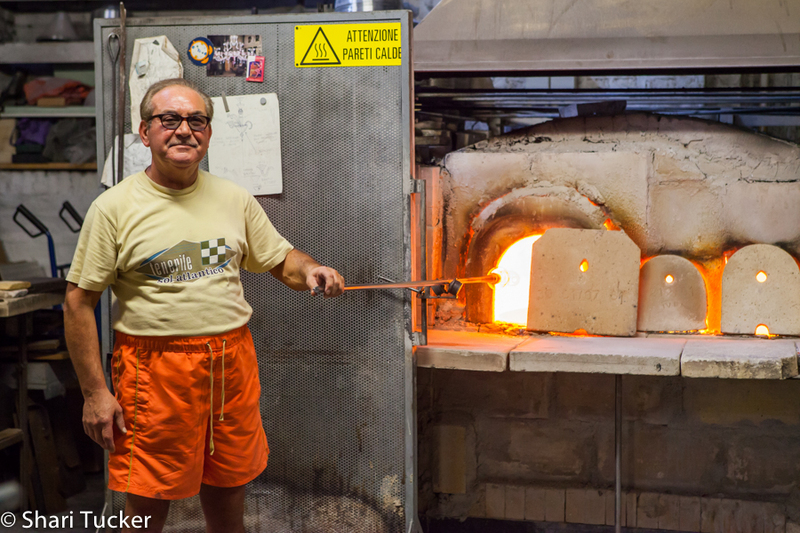 There are about 600 glass blowing artists in Venice and about 40 of them work out of this particular factory. Each section of the gallery was a new discovery. Sadly, but also understandably, no photos or videos are allowed as these are one of a kind pieces of art. It is like a museum of the best glass works in Murano. Some artists have collections of items in the gallery, others have only one or two master pieces. The artist that I saw at work is known for making chandeliers and most of the ones in the gallery were hand-crafted by him. The detail in each and every tiny little piece is magnificent. I learned about the different styles of glass work and the family history behind glass blowing. 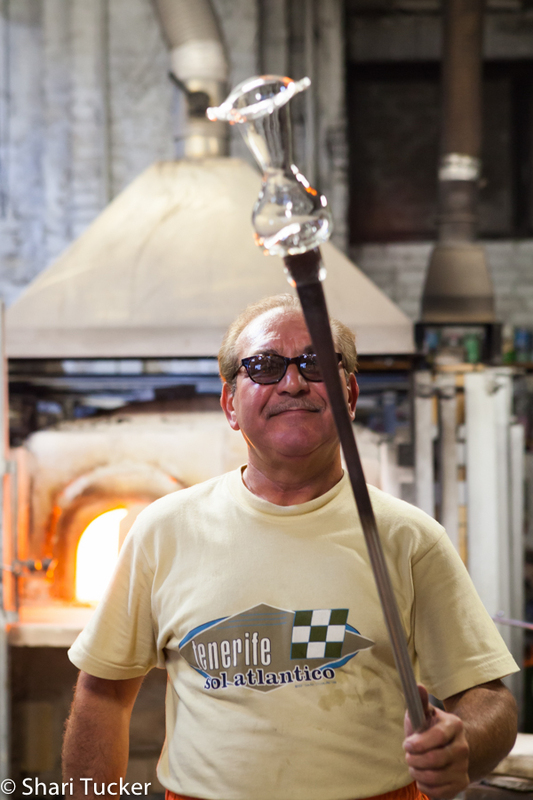 Glass blowing has been handed down through generations from fathers to sons. The trade nearly always stays within the family and only ends if there are no further sons born into the family (no pressure ladies!). There are no women glass blowers, however many women in the family are talented artists and do much of the painting and finish work on different styles of glass works, such as the gold or silver plating. One of my favorite sections of the gallery was from the family who creates only animals. On display were about 30 different one-of-a-kind animals from turtles to owls, cats to ducks, horses and more. My favourite ones were the jellyfish with their detailed tentacles and bubbles coming out of the ‘glass’ water around them. It was explained that there are three types of commercial glass works. Master artists who create one of a kind art that is sold to collectors and often to buyers for large businesses, or groups of businesses. Regular glass blowers who create mass market products mainly for the tourist industry. Regular glass blowers who work with recycled materials to create lower grade quality items that may have imperfections. Also for the tourist market, but also ensuring that remnants of glass from all of the works are recycled. Alex was very excited to answer all of my questions. He was very proud to share this part of his history and culture with me. I couldn’t have asked for a better guide and all for free! Of course, I stopped at the store on the way out to buy a souvenir (or two) … it was the least I could do after having an hour long, private tour with such a fantastic guide. After the tour, Alex was quick to give me a map and invite me to visit the rest of the island as well as direct me to the vaporettos for when I was ready to return to San Marco square. I spent about an hour wandering the main streets of Murano and taking a few photos, looking at store after store of beautiful, but completely different styles of glass works. 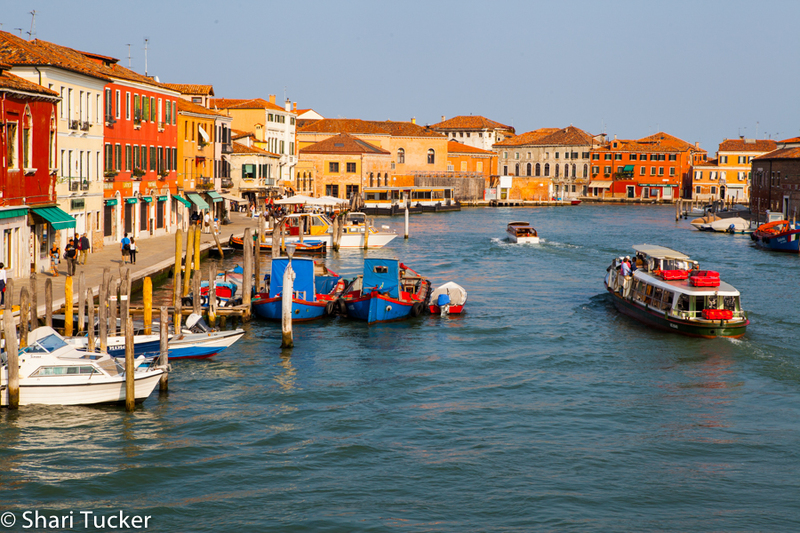 Around 5pm, I returned to the vaporetto stand to head back to Venice Island. 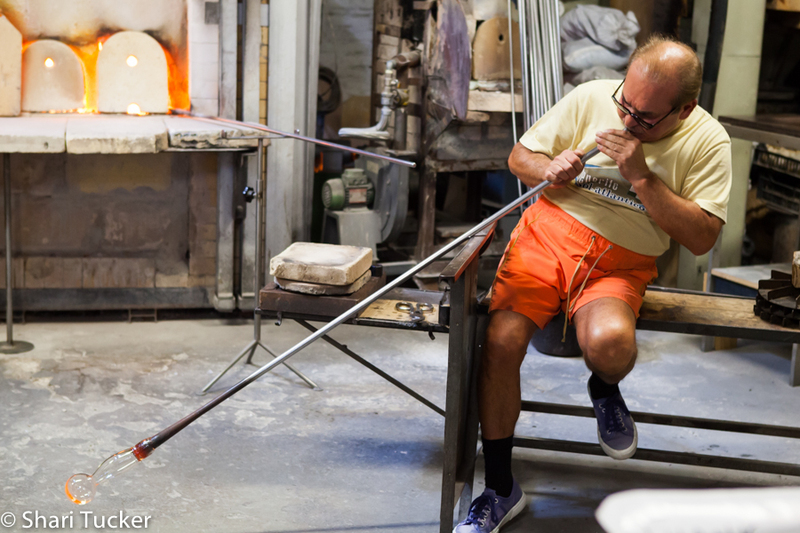 It was a lovely day learning about the artistry of blown glass and the history of Murano, Italy. I would love to see that gallery! It was really amazing. Sad that I wasn’t allowed to take any photos, but they are all ‘works of art’ that they don’t want to risk reproduction on. So glad I did the tour. Really was interesting.